Sapienstone countertops offer a unique user experience and proudly names Faithful Countertops the best porcelain countertop fabricator in New Jersey, and New York area. 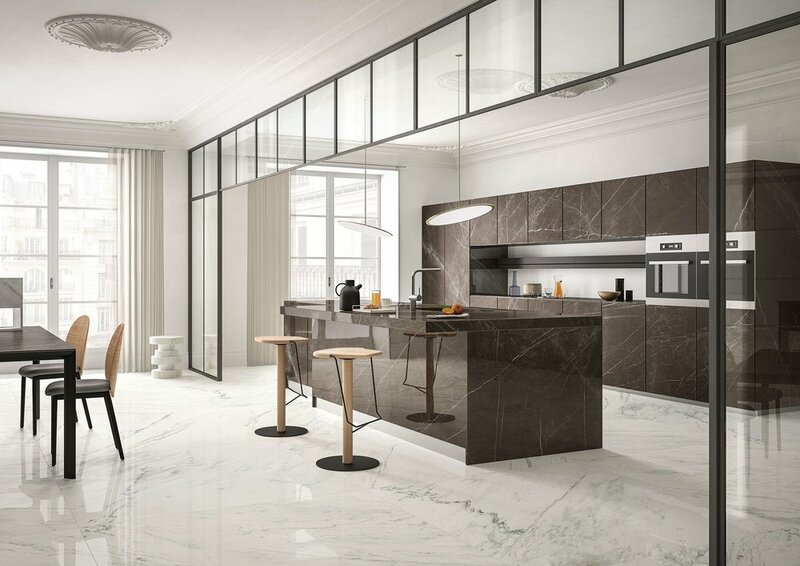 The SapienStone brand was created specifically as a surface for the kitchen and for furniture, with stricter quality control than other porcelain tile products. The range of colors for SapienStone kitchen countertops and furnishings is listed below. The colors in the catalog most frequently used in kitchen countertops are white, beige, grey and black. Some materials are available with two different finishes. SapienStone dresses up the kitchen in a great variety of colors. SapienStone countertops are full-bodied porcelain imbued with veining that give its surface a more realistic look: a look that is unmatched in any other product. Sapienstone is the Iris Ceramica Group brand that designs and creates porcelain stoneware kitchen tops. In Sapienstone products attention to design and aesthetics, but, above all, to their daily use, is clear. Innovation in terms of attention to functionality and well-being, together with sustainability, are Sapienstone’s fundamental values. As an element crucial to both design and functional requirements, the countertop is one of the most critical features of the kitchen. The choice of countertop is one of the most important decisions when designing a kitchen, and a major investment destined to last for many years. The name ‘Sapienstone’ is no coincidence: it expresses the elements that characterize this innovative product. Without a doubt, Sapienstone represents the most ambitious of challenges for the Iris Ceramica Group founder. It has spread ceramic know-how to the world of kitchens, providing a product with an elegant design that is also healthier. Composed of ceramic clays and unalterable mineral colors which do not suffer the effects of heat, light or use of chemical cleaning and disinfection products, SapienStone reveals all the best features of the technical and aesthetic performance of Iris Ceramica Group porcelain materials: unalterability, resistance to chemicals, stains and scratching ("greater than that of any other product, including wood, laminates and quartz surfaces"), as well as easy cleaning. It is particularly worth noting its complete in-absorbency, a feature typically associated with porcelain, thanks to which it is possible to place and work with foods directly on the kitchen countertop, without using a cutting board or another base under foods and dishes. Sapienstone solutions offer endless advantages that were unthinkable until recently, closely linked to the demands of contemporary living: resistance to high temperatures, stains, chemical products, and scratches.